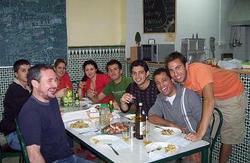 Malaga Hostel is five minutes walking distance from the best beaches of the famous area Pedregalejo. 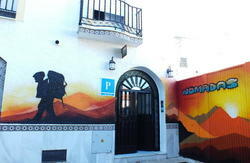 Our Hostel is the first one in Malaga East. It opened in June 2011 and is designed for medium and long term stays. facilities, amenities and price are main features of the Hostel that will make guests enjoy a unique experience in a safe and familiar environment. In a range of less than 500 meters there is public transport, restaurants, shops and leisure time facilities available. Our guesthouse is a building that features three floors and a solarium. On the ground floor we have the reception and a multimedia room. On the first floor, in the sleeping area we have a double bedroom, two four people bedrooms and a six people bedroom, all of them contain a private terrace, air condition, a desk and a individual wardrobe. On this floor there is also the kitchen located where breakfast and other meals can be prepared daily. We have dining area and storage for guests as well as common freezer. Laundry facilities are also available. The solarium is located on the rooftop terrace with a great sea and mountain view where our guests can lay in a sun bed, have a meal on the dining area or just chill out and enjoy the sunset. Cancellation policy: 7 days. Late cancellations will result a charge of the amount of the first night. No show up will result a charge of the amount of the whole reservation. We accept cash and credit card as payment on the arrival. Malaga property is located in Calle Conde de las Navas, 1. In the corner of Avenida Juan Sebastin Elcano and the river Arroyo Jaboneros. This is the East area of Malaga known as Pedregalejo. We are 4km from the city centre. There is public transportation by bus (Line 11), the stop named Arroyo Jaboneros is 20 metres from our property. By car: Exit 246A from the Highway A-7, follow San Isidro avenue and at the end of this, Conde de las Navas Street until the number 1.